I am just going fruit crazy this week! I have the following fruit in my kitchen as we speak; strawberries, blackberries, blueberries, apples, peaches, lemons, limes, pineapple, watermelon, plums and raspberries. I am trying to stay away from the sweets, so I am filling my belly with fresh fruit with natural sugar, rather than chocolate and ice cream. It has been a pretty easy transition. Though a nice piece of chocolate sounds good. But you know what is way better for you? Today’s dessert. 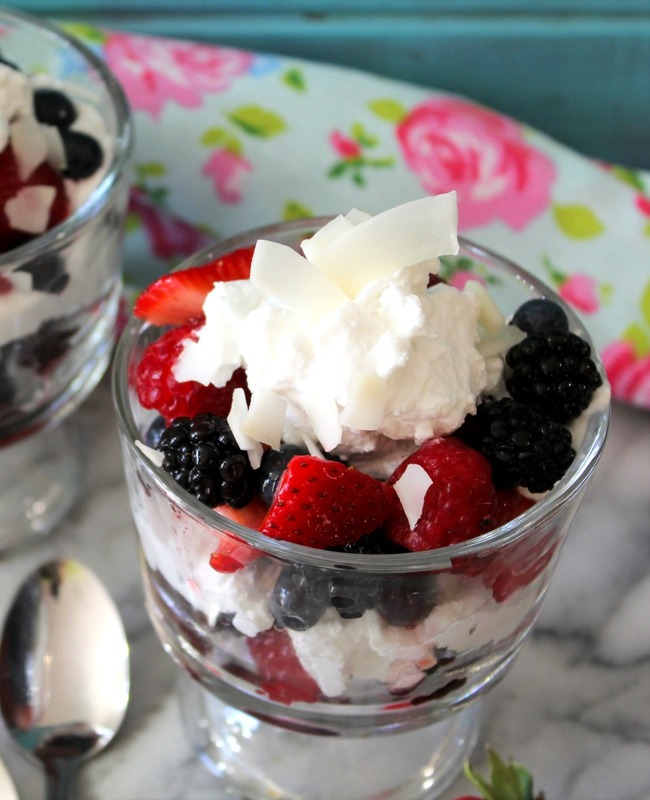 I have for you Coconut Berry Parfaits. It’s like eating summer. The Coconut Berry Parfait tastes out of this world. 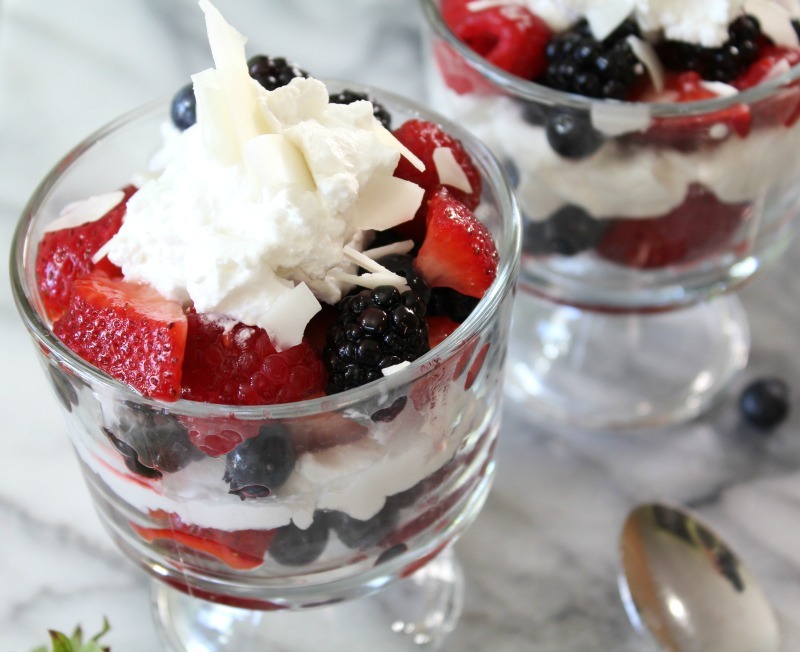 Sweet berries layered with easy to make homemade coconut cream. I could not stop eating this. When I was making it, I would take a berry, then a scoop of whip cream. My Husband comes home from the store and says do you want a burger for dinner? I said no, I’m full. What? You were hungry 20 minutes ago. Well…. I kind of overdid it with the berries and coconut cream. I can’t help it, I had to taste test it, again and again and again, you get the picture. I started the recipe by preparing for the coconut cream. The day before I made this I put a can of full-fat coconut milk in the refrigerator. I used Trader Joe’s brand, it’s my favorite. Once it was ready, I poured out the coconut water and scooped out all of the coconut meat and added it to my mixing bowl. I whipped it together in a matter of 3 minutes and added a pinch of powdered sugar and vanilla extract for extra flavor. I refrigerated it until I was ready to use it. 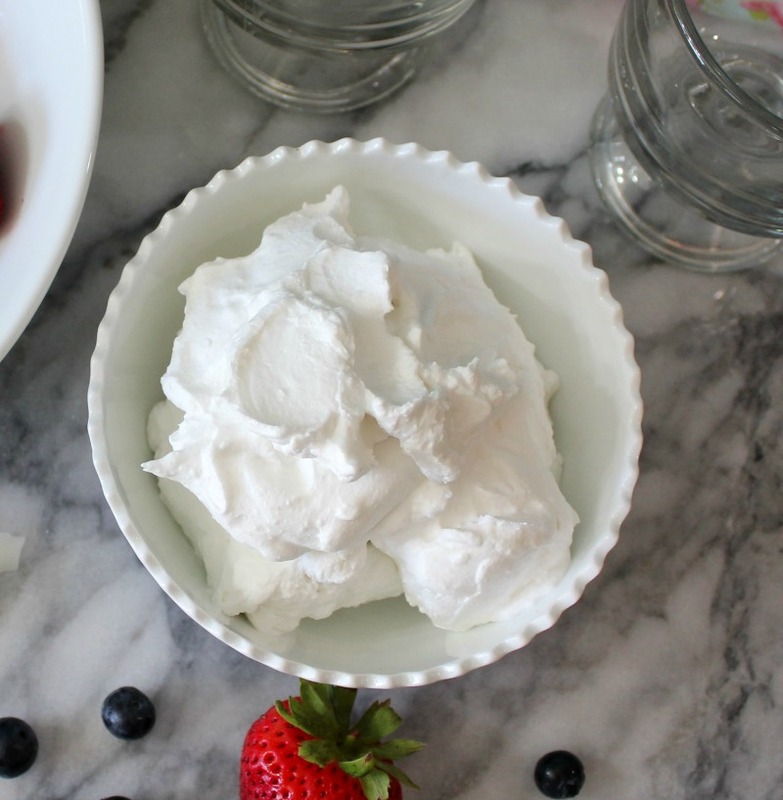 Making coconut whip cream is so easy and fun, but do know it is a tad heavier than whipping cream and has a very strong coconut flavor; which I love. 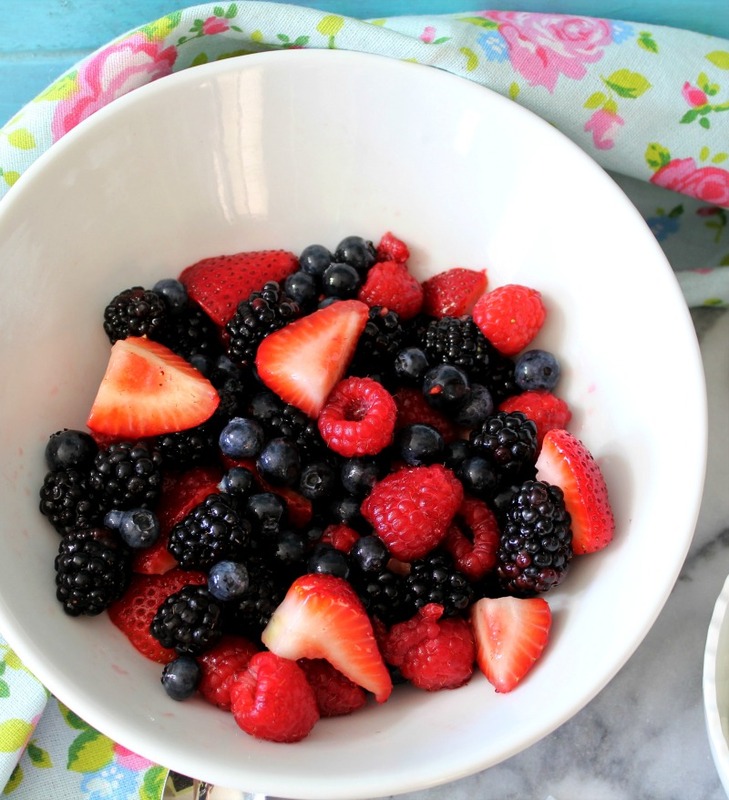 Just before I made the coconut cream I added my berries in a bowl and added a pinch of lemon juice and sugar. Just mixed it up and waited for the fruit to get juicy. 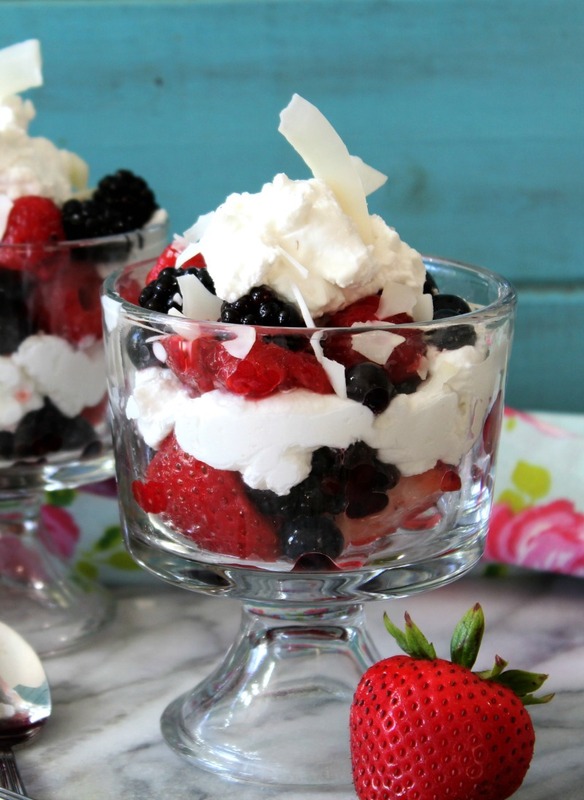 Go light on the sugar this time of year because the berries are so much sweeter. Now it’s time to make the parfaits. 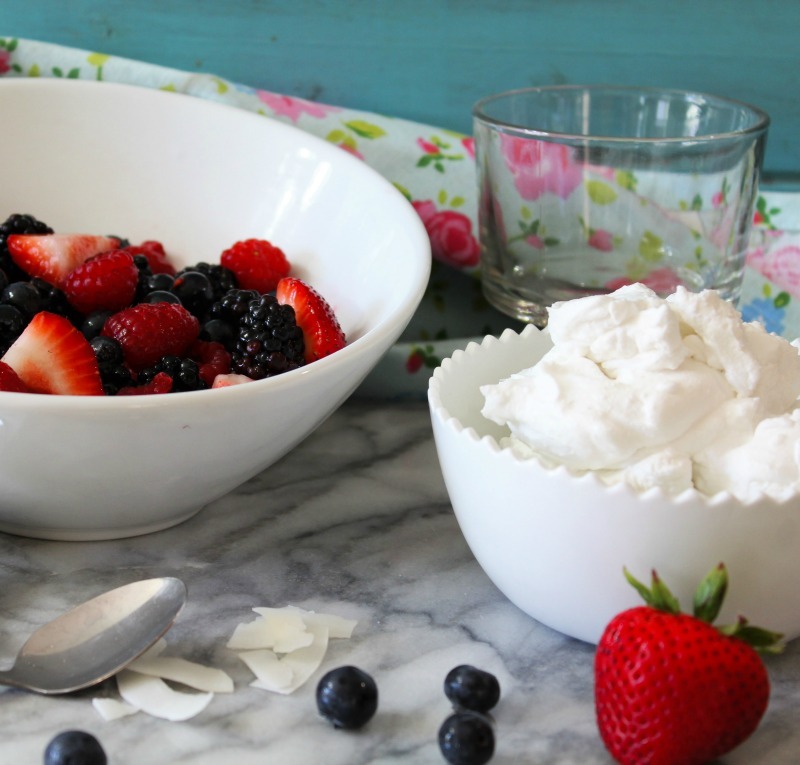 I just added the berries to a dessert bowl, added a little bit, OK a lot of coconut cream and topped it with more berries and one last dollop of coconut cream. I added a little bit of roasted coconut on the top. I used Trader Joe’s Roasted Coconut. I love the roasted coconut. I sometimes eat it as a snack. Dessert is ready to serve. Oh and before serving, add a sprig of mint. I bought mint for this recipe, and I forgot to add it. The mint will add a little bit of color. This recipe could make 4 servings, but I went for 3 servings since I ate some of the berries and ate some of the coconut cream before putting the parfait together. I always say the more fruit and coconut cream the better. I could easily make this one serving; all for me. he he But I shared it. By the way, you will have left over coconut cream. I used about half for the recipe. Just cover and store the coconut cream in the refrigerator for about a week. I did the best I could while calculating the calories for this recipe, but it’s hard when you make coconut cream. 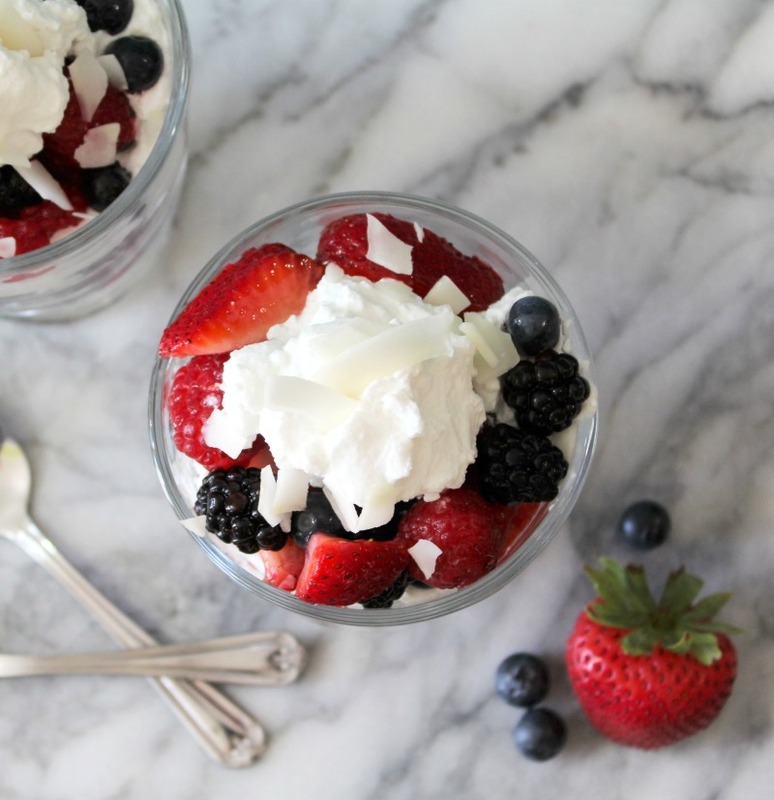 A light, summer parfait layered with sweetened berries and coconut cream. hours prior to making the parfait; add coconut milk in the refrigerator. Open the can of coconut milk and scoop the solid white coconut cream into a bowl. Discard the coconut water. With a hand mixer or stand mixer; beat the coconut cream until light and fluffy; about 3 minutes. Add powdered sugar and vanilla extract. Beat until well combined. Place in the refrigerator until ready to use. Meanwhile; in a medium bowl add fruit, 2 tsp. sugar and lemon juice. Mix until well combined. Let it sit for about 10 minutes until it gets juicy. 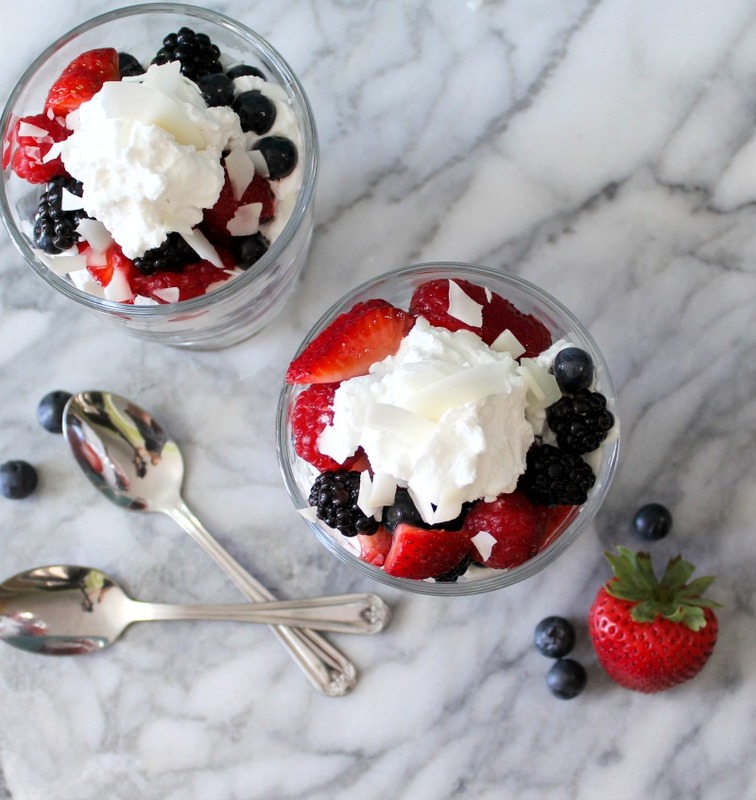 In a 3 cups or bowls; evenly divide half of the berries, top with about 3 tablespoons of coconut cream; add remaining berries, top with a dollop of coconut cream. Add shredded coconut, if desired. You can use any fruit you like. Also there was more then half of the coconut cream left. Cover and refrigerate for about a week. I just love this dessert and it is such a treat to eat. Nothing beats a light refreshing dessert when it’s 90 degrees out. This parfait is also perfect for serving at a BBQ, or brunch and it also is vegan, and gluten-free. You could also make this in a mason jar, seal it up and pack it in a cooler for having at a picnic. How cute would they be in little mason jars? What a great way to start the week! I am loving berry season. Now what to do with all the other fruit I have? Can’t believe I bought so much! Be prepared for pineapple and watermelon recipes next. I cannot get enough of berries this year! And fruit in general but I’ve really been stocking up on the little guys- blueberries, blackberries, etc. I love this idea for a nice light dessert! Thank you Mary Frances. I love berries this time of year, so sweet and plentiful. Thank you Nick! I am kind of addicted to this dessert!